It’s almost time to say goodbye to Ravnica Allegiance. Just around the corner is PAX East and the start of preview season for War of the Spark. I am incredibly excited for a limited set with a planeswalker in every pack and look forward to the gameplay and card evaluation puzzles in store for us in the weeks to come. But until then, we’ve still got more time with one of my favorite sets in recent memory. Even two months into the format, I find myself discovering new interactions on both my side and my opponent’s side of the battlefield. However, there are a handful of situations I find myself in the middle of again and again. In celebration of all this format has to offer, I thought I’d run through a little grab bag of mini puzzles that RNA offers on a frequent basis. When should you play lands if you have a card draw spell? I could sing the praises of guildgates all day. Having lands as viable picks adds another layer of complexity to your decisions in both drafting and deckbuilding. When some number of your lands come into play tapped, it should change the way you sequence your plays. I come from the school of thought that dictates playing your lands in your first main phase. The exception to this rule comes from playing card draw spells off curve. For example: on your fifth turn you are planning to cast Sphinx’s Insight with your four available mana. Even if you have a fifth land in your hand, don’t play it out yet. 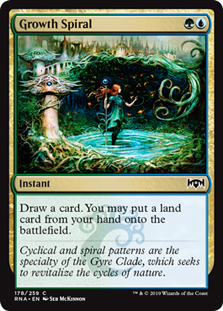 In the event that you draw a guildgate you would much rather play it as you aren’t planning to do anything else with that last land anyway (assuming you also don’t have a relevant 1-mana play you could draw off the Insight.) It’s a small sequencing mistake, but it can certainly have a negative snowball effect for future turns, causing you to not curve into your Archway Angel or be denied the ability to double spell effectively on turn six. Opponent attacks with Plague Wight on turn 3. You have a two drop in play, but it’s more considerably more valuable. Do you block and offer the trade? Two words: Blade Juggler. There’s almost nothing better to do in this format on turn three than play a 3 powered creature that draws you card. 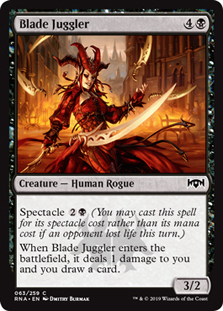 It’s the reason many people (myself included) have Blade Juggler as the best common in the set. If you can enable spectacle for it, it’s an incredibly powerful and efficient play. That’s why I’ve gotten in the habit of snapping off blocks when possible on turn 3 against black decks. Depending on the matchup and my hand, I’ll gladly trade my Senate Guildmage for their Plague Wight if I can just to ensure they don’t get to deploy their “Skulldrifter” on turn 3. And you should too! Conversely, keep in mind if you played the last black two drop that smart opponents will do their best to keep you off of turn three spectacle whenever possible. Use this to your advantage to perhaps gain a favorable trade or push damage if they decide not to block. How do I get rid of that pesky Gate Colossus? 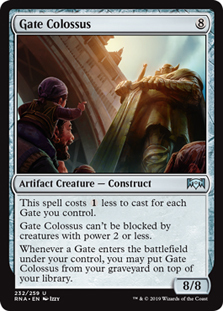 One of the more powerful cards in this format is the uncommon colorless gate payoff Gate Colossus. Depending on the tools in your deck, this just may not be a card you can reasonably deal with on the battlefield. So it might be time to get creative. A couple of my favorite ways to ensure this doesn’t find its way back on top of my opponent’s library is to respond to the land trigger with a Junktroller activation or cycling the first half of Consecrate // Consume. Carrion Imp can grab it on your turn and Incubation // Incongruity can get it exiled for good right from the battlefield. 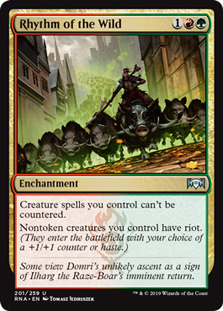 The next time you’re sideboarding against this card, make sure to consider all your options. It’s likely that you’ll have something that is profitable against the 8/8 menace. Mana sinks like Adapt are fantastic for limited. They give you places to put your mana late in the game and make for interesting gameplay as open mana can represent many different things. 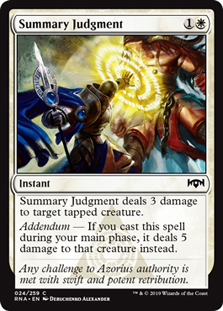 Adapting creatures against open white mana when deciding to attack can be tricky because of one card: Summary Judgment. If you’re planning to adapt anyway, the general rule of thumb is to adapt pre-combat to get your creature out of range of the 3 damage the spell represents. There are of course a whole other mess of considerations past that. Do they also have black mana for Grotesque Demise? Or blue for Arrester’s Admonition? Or green for Titanic Brawl? Or red for Scorchmark? Do you have a Stony Strength which can untap your creature causing the Summary Judgment to fizzle? 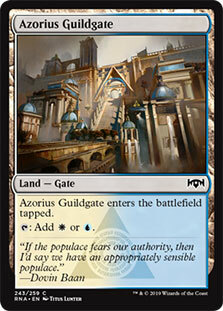 And my personal favorite exception: what if your opponent has an active Syndicate Guildmage in play? This might cause you to attack with your Sauroform Hybrid first before sinking six mana into it to adapt to get it out of range of being tapped down pre-combat. TLDR: There’s a lot to consider when deciding the correct order of Attacking and Adapting. How do I stop Guardian Project from going off? If your opponent casts a creature spell with Guardian Project in play, you can prevent them from drawing a card if you have a removal spell. With the Guardian Project trigger on the stack, kill their creature. Then, when the trigger from GP resolves, it will see a creature in the graveyard with the same name as the creature that just entered the battlefield, and it won’t give them an extra card. 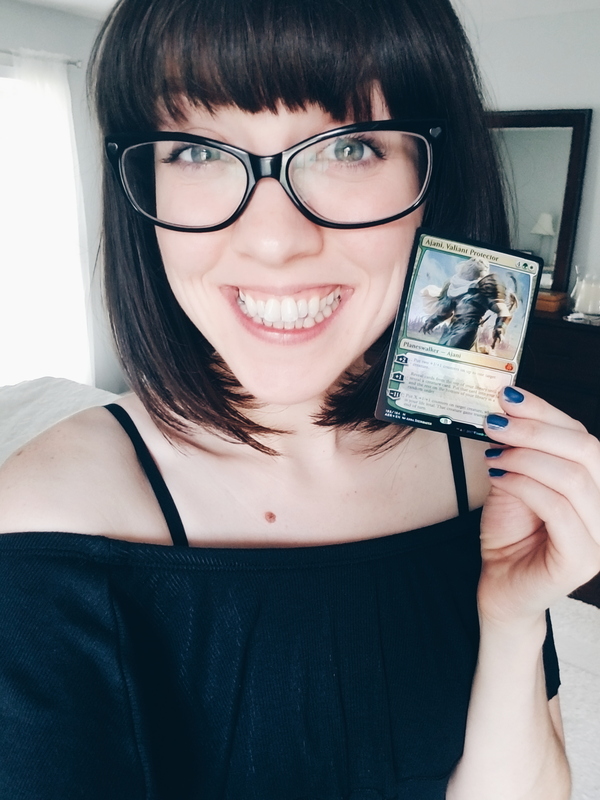 Is Captive Audience a safe play against Orzhov? If you find yourself in a situation where you’re running Captive Audience, beware of casting it against Orzhov opponents. If you’ve been around the draft block, you’ll have had the line of text on Final Payment “Creature or Enchantment” be relevant on more than one occasion. 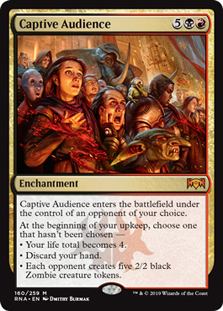 And if your opponent happens to give you an enchantment in the form of Captive Audience, don’t make the mistake of thinking it’s a curse like Curse of Death’s Hold. It actually becomes donated to the opponent and they can do with it what they like. Are my counterspells dead against Rhythm of the Wild? It’s important to note that Rhythm of the Wild does not stop counterspells from being able to be cast. It just stops their effectiveness at countering said spell. Your Frilled Mystic is still a 3/2 with flash. Essence Capture can still put a +1/+1 counter on one of your creatures. And Thought Collapse can still mill your opponent for three. Rarely will that be relevant, but it’s important to know what your options are! UG mana open in combat? What’s the worst that could happen? What other interactions or situations have you come across in this format that you feel like you’re on top of? 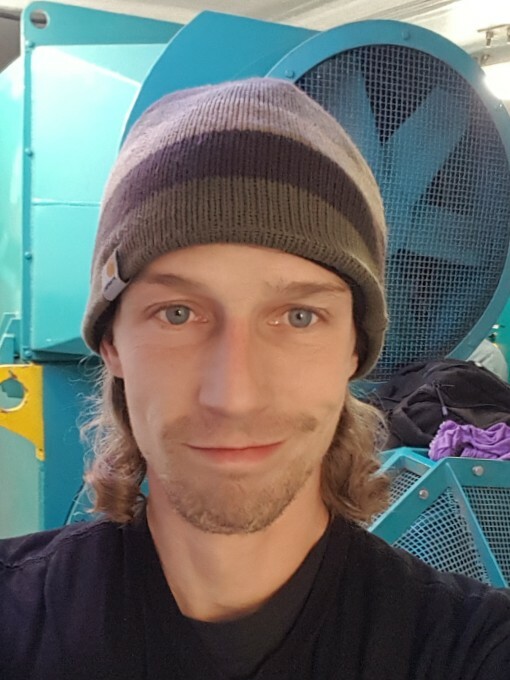 Let me know on twitter! And, as always, Happy Drafting!